In recent years, WordPress (WP) has developed and even exceeded expectations. According to available statics, more than half of the websites on the internet are powered by WordPress. What made WordPress so attractive is because you can fully customize it to suit your needs. When creating a content on WP, you may need to clone any of your posts or pages or you may need to link any post with a menu without leaving the page. If you want to duplicate post, it means you will need to create a fresh page or post, or linking to any post with a menu is almost an impossible task before now, no other plugin have this feature except this new plugin called Postmenu. Thanks to this plugin, you can do all tasks without writing a single line of html or leaving your current page. 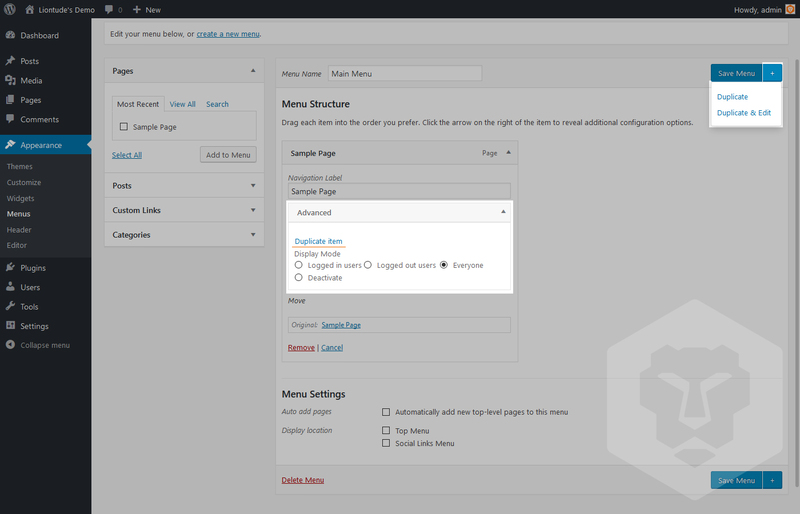 To duplicate or link to any posts on WordPress, you simply have to download a WordPress plugin known as Postmenu. Postmenu is an open source plugin designed by Liontude that allows you to link posts and menu easily. Now you don’t have to create fresh post or page anytime you want to clone them, you do not even need to search for menu links anymore; this plugin does it for you automatically. What you need to do is just to download Postmenu and use it. 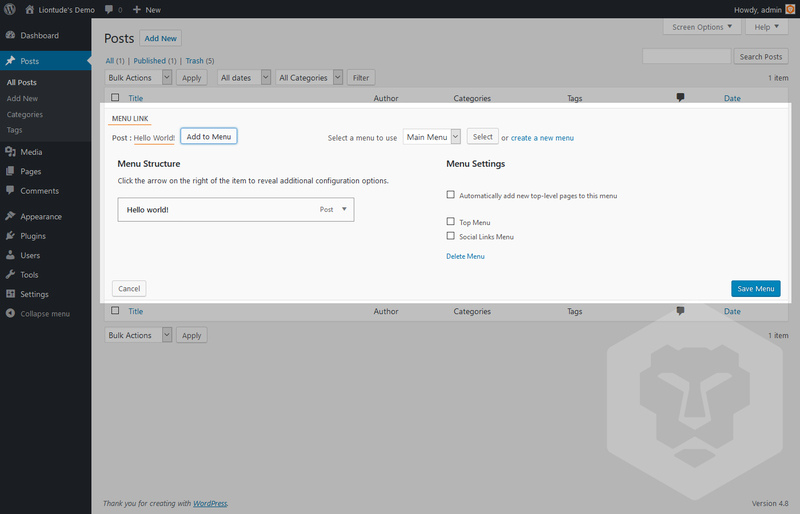 This plugin makes it easy to use WordPress. 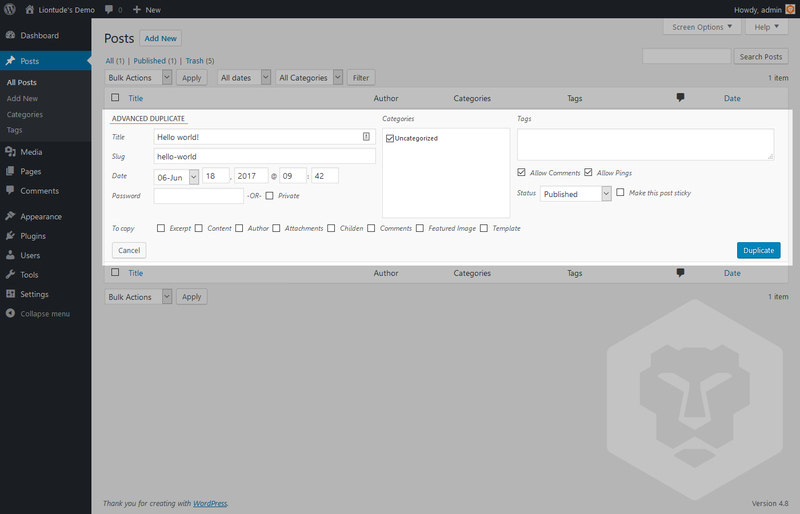 This plugin also allows you to customize the settings to suit your needs based on your actions. Why do you Need Postmenu? Most people create similar posts and pages on their WordPress site. For instance, if you have an online shop and you need to add products to the shop, doing this one after another can be very exhausting and time-consuming. When you are working with posts or pages that come with the same custom fields and values, but different title, you do not need to create them one after another. The best alternative is to use “Postmenu” plugin to clone these custom fields, posts tags, and categories, and then you can manually change the title when you are done. Postmenu, without a doubt, is a very powerful and useful plugin. If you have a WordPress site that needs creating similar posts or pages such as those who manage e-commerce sites, you definitely need to install this plugin today. You also need it when you want to link to other posts or menu easily. Postmenu supports posts and pages by default. However, it still allows you to apply custom settings to suit your needs. You can as well customize this plugin to enable you to choose what to copy when duplicating a post or linking to a post or menu. After the installations, it works with the default options. However, you can go to the “Settings” to choose how you want it to work. Installing Postmenu on your website is a very easy task. 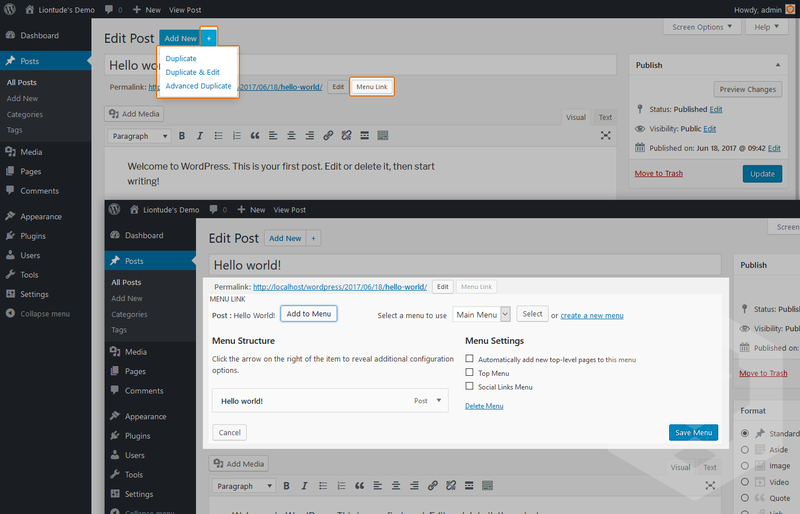 Anyone with basic WordPress knowledge can easily install and use it. You can easily download Postmenu from the WordPress directory. When you click on the link, the file will be downloaded on your computer as a zip file. 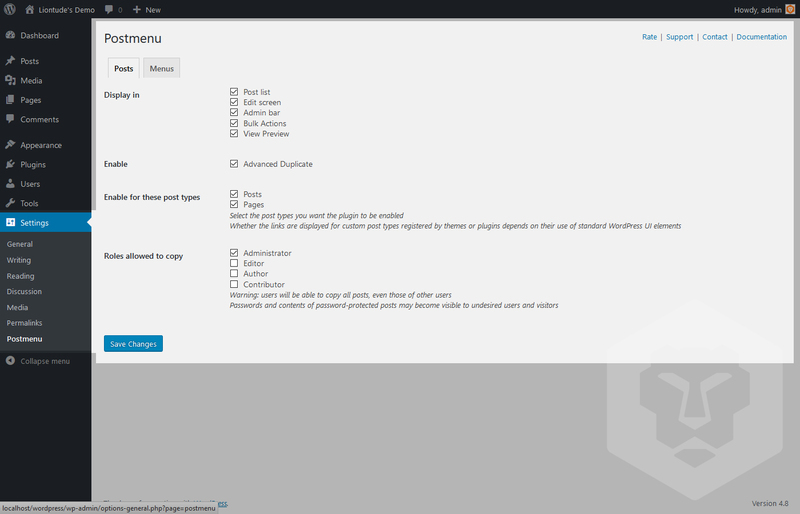 Log in to your WordPress dashboard and click on “Add New Plugin” > “Upload plugin” – After you clicked on the upload plugin, a folder will open on your computer, select the “Postmenu” from the file you downloaded and upload to WordPress plugin directory. Once the installation process is completed, click on “Activate” to activate the plugin. 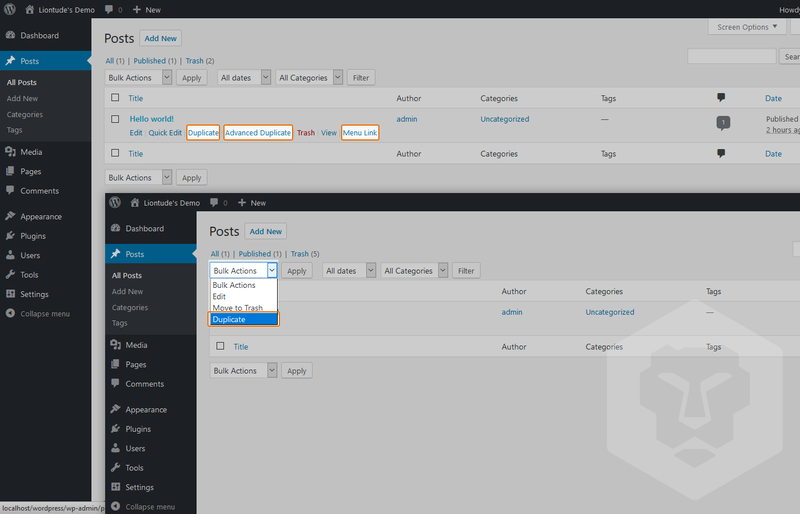 Once the plugin is activated, you can then go to the “Settings” > “Postmenu” and customize the plugin to suit your needs. Without a doubt, every webmaster will find this plugin very useful at some point. Postmenu is a free plugin, so, why not try it now?. Once you install it on your website, you won’t have to worry about creating similar posts again. You can easily duplicate these posts and easily link to any menu using this powerful plugin.